Mulaney’s success is due in no small part to that “mayor of nothingness” quality he has. He freely admits that he needs to be liked by everyone, and this has led him to cultivate a persona that moves past likable or even lovable. Indeed, Mulaney has tread into what are generally considered to be extremely dangerous waters for a comedian, and those waters don’t make waves; that is, Mulaney is inoffensive. In fact, he is aggressively inoffensive. Mulaney freely admits that he needs to be liked by everyone. I am not damning him with faint praise. Rather, I am praising him with faint damnation. 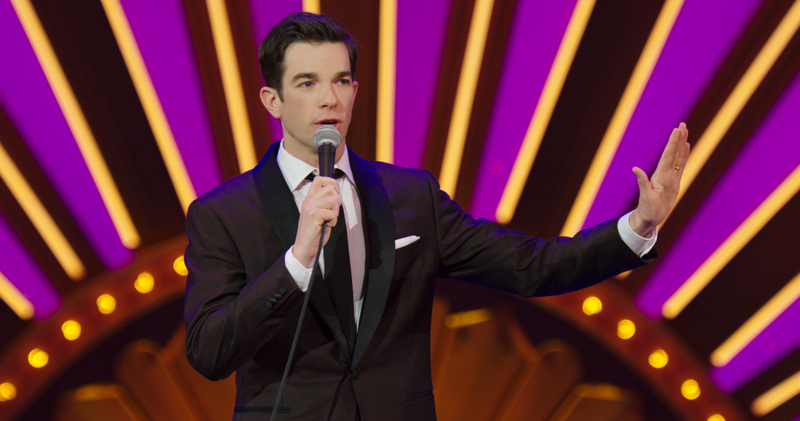 Hear me out: the most objectionable thing about John Mulaney, to some, would be that he is a white, heterosexual male. (In other words, there is a lot of privilege and power in the white male voice, which, categorically, may be to some objectionable: as a white male he doesn’t see the urgency in engaging in discourses on race and patriarchy.) But Mulaney has nary an offensive bone in his seemingly 100-pound body. He is a throwback to a kinder, gentler time in comedy, a time before Lenny Bruce, Richard Pryor and George Carlin made race and patriarchy part of the cultural discourse. And that is what is so likable about Mulaney: he hearkens to another era, but what era that is isn’t exactly clear. Sure, he wears cufflinks, a suit and tie, speaks with what can best be described as a quasi-Mid-Atlantic accent and doesn’t use profanity. But it isn’t as if he is channelling Bob Hope or Jack Paar. His work is very much of this moment. Yet, he makes you, me, your mom and your grandpa reminisce fondly on times gone by. He somehow manages to ooze nostalgia, while never being reduced to a nostalgia act. This amorphous, egalitarian nostalgia that Mulaney puts forth is where his primary strength lies: There are no qualifications to his appeal. Everyone loves (or can love) Mulaney. Perhaps his multigenerational appeal comes from the fact that much of his humor focuses on conflict between the generations, or more specifically, him and his parents. Mulaney frequently acts out exchanges between his childhood self and his mother and father—usually his father, a rather dry, conservative Catholic attorney, of whom Mulaney says, ‘’My dad is so weird, I’d love to meet him someday.’’ His anecdotes about his at times painfully awkward, yet clearly loving relationship with his father, are some of the highlights of his work. In “Kid Gorgeous” he tells of a dinner conversation between his father and his then 6-year-old self, which began with young John telling an innocent anecdote about seeing another kid pushed off a swing on the playground. It ended with his father likening his son’s moral complacency in not coming to the assistance of the injured kid to those that looked the other way in Nazi Germany. Mulaney was raised Catholic, attended a Jesuit high school in Chicago and went on to study at Georgetown before embarking on a career in comedy. His faith, or lack thereof, plays a significant role in his work, as seen in both “Kid Gorgeous” and “The Comeback Kid,” where he introduces the topic of religion by saying, “Now, I was raised Catholic, I don’t know if you can tell that by the…everything about me,’’ while gesturing toward his pasty, black Irish appearance and his suit, looking every bit the 8-year-old at his First Communion. Like every lapsed Catholic worth his salt, he takes the requisite jibes at the church. He wonders when it became normal that after telling people you were a former altar boy (he was), they respond as if you had just told them you once worked as a French maid. He somehow manages to speak to a large audience without ever losing his integrity or intelligence as a performer. Mulaney admits to being fundamentally apolitical, and indeed there is little political content in his oeuvre. Yet ironically, it is a political piece where Mulaney’s comedy shines the brightest. In one six-minute piece in “Kid Gorgeous,” he does one of the most ingenious and hilarious political commentaries put forth in a long time—which given the saturation of political based comedy out there right now is saying something. Not surprisingly, the bit is in no way objectionable. In fact, its hilarity is directly linked to its inoffensiveness: no names are ever mentioned, the entire piece is done as an analogy primarily using animals (which I won’t ruin for you)—think Orwell, if Orwell saw the glass half full. Suffice to say, it is comedy of the first order and if you don’t watch any other part of the hour long special, do not miss those six minutes. Somehow Mulaney has managed the nearly impossible task of being an incredibly relevant comedian whose appeal crosses the generational divides. In a world of rapidly expanding and specialized media platforms, there doesn’t seem to be much room at the table for entertainers with broad appeal. It is a testament to Mulaney’s gifts that he somehow manages to speak to a large audience without ever losing his integrity or intelligence as a performer. This article also appeared in print, under the headline "John Mulaney is running for mayor of comedy," in the September 17, 2018 issue. Jake Martin, S.J. is a doctoral student in Film at Trinity College Dublin and a Research Fellow at Trinity Long Room Hub, Arts and Humanities Research Institute.